Maria Sharapova celebrated her 27th birthday in true German fashion! The tennis pro rang in her B-day by visiting the annual Stuttgarter Fruehlingsfest, a spring festival and biergarten in Stuttgart, on Saturday. Sharapova dressed the part, donning a silver traditional German dress that featured white and pink accents. The blond beauty completed her look with heels and a heart-shaped purse with the message “You are my great luck” in German. Sharapova, who was in town for the Porsche Grand Prix, was all smiles while touring the biergarten and riding festival rides like the Ferris wheel. Maria Sharapova celebrated her 27th birthday the way most 27-year-olds do: by wearing traditional a German dress while sitting on a Porsche with a costumed team of men in lederhosen. Celebrities, they’re just like us! Has it really been 10 years since Sharapova won Wimbledon as a 17-year-old? She celebrated her big day in Stuttgart, Germany, where she is the two-time defending champion at the Porsche Grand Prix, which begins on Monday. 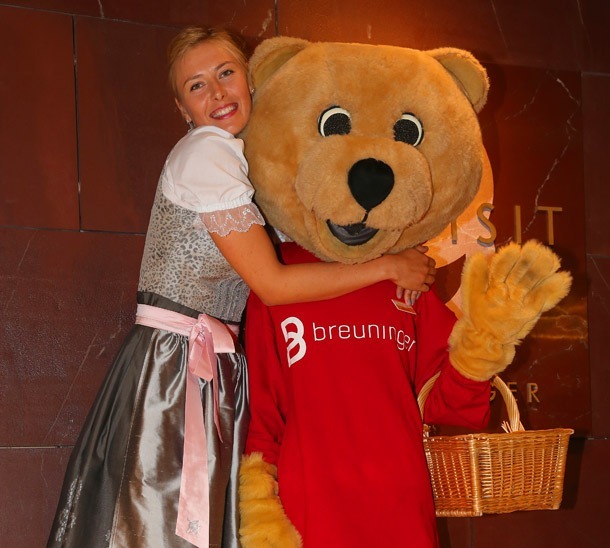 Joined by her team, Sharapova decided to dress up in a traditional German dirndl for the kind of photo adventure you can only find in Germany, one that involves luxury cars, merry-go-rounds and enormous teddy bear mascots. Any guesses for Sharapova’s birthday wishes? A healthy shoulder? Not having to play Serena Williams at any more major tournaments? That all WTA tournaments be relocated to Stuttgart, where she has never lost a match? It’s not your birthday until you’re given a giant cookie. The merry-go-round: amusement park ride or metaphor for the tennis season? Not even Sharapova can get her agent, Max Eisenbud, to ignore his phone. I’m just impressed they found a bear taller than she is. Did I mention that the title sponsor of the Stuttgart tournament just happens to be one of Sharapova’s sponsors? And that her new Sugarpova flavor is called “Speedy,” and it features gummies shaped like a Porsche 911? All a coincidence, I’m sure.